Justice join the great, eclectic beast that is our Main Stage. And we all know that their headline show is going to be monumental. Their back catalogue boasts some of the most epic dance music ever produced. Every show renders stadiums euphoric, leaping skyward and baying for more. They join Nile Rodgers & Chic, Bastille and Jon Hopkins, alongside Kamasi Washington, Baxter Dury and !!! (Chk Chk Chk). With an astonishing roster of up-and-coming talent underneath them in the form of IAMDDB, Mahalia, Joy Crookes. Return to that perfect forest dancefloor. Presided over this year by the incomparable Groove Armada, the super-fresh Peggy Gou and the incredible George Fitzgerald. The very definition of epic, The Valley is a space which feels preordained for flamboyance and unity. The place to lose yourself in the heavenly delights of dance music. Every moment you spend here, bubbling beneath the lasers, hands high, will be sublime. Our compendium of high arts is now complete. 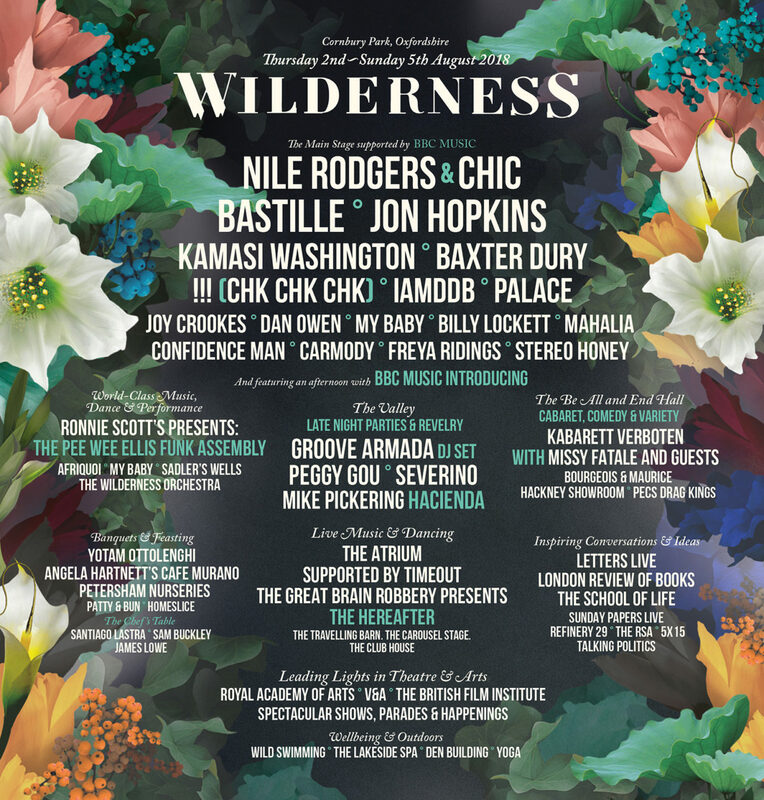 A bristling line-up which assembles sensational music, arts and dance from and around the world, The Atrium supported by Time Out is the best bits of Wilderness collected under one canopy. Jazz institution Ronnie Scott’s brings the Peewee Funk Assembly, celebrated dance institutions Sadler’s Wells and Rambert are joined by fresh talent. We’ve headline shows from Beating Heart, Afriquoi, My Baby and more. Hip Hop Karaoke rubs up against histrionics from Oh My God It’s The Church, mass yoga meets swing dance. This year our Travelling Barn begins with the finest acoustic talent you could wish for, before the sounds shift into different realms. You can expect a Jazz takeover on Friday with The Dylema Collective’s love-jazz, a full-power dance experience with Balkan-inspired Don Kipper and Manchester afrobeaters Agbeko. Saturday raises the temperature further, with another raucous night of mayhem ignited by the 17-piece Patchwork Jazz Orchestra, Rum Buffalo and electronic acts Chelou and Bearcubs. Sunday is the Hoe-down with Cut-A-Shine. We all know how that goes…. The newly announced three piece Kitty, Daisy and Lewis head up our most rock n roll stage The Hereafter. They’re joined by a range of rockers from the scene – courtesy of The Great Brain Robbery – including Wilderness faves Cosmic Strip Continental Drifts bring the vibes as ever with Errol Linton, Whisky Shivers and vintage DJs Lady Kamikaze, Count Sizzle and Madame Barducci.